Our hearts were saddened when this great young Boxer had an unfortunate accident and left us at such a young age. 2/93 Major, Best of Winners Lumberton K.C. 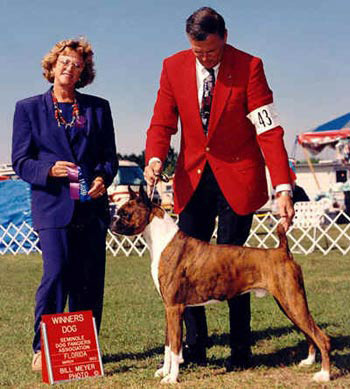 4/93 Winners Dog, BOW, Best of Breed West Volusia K.C. 4/93 Winners Dog, BOW, Lake Eustis K.C. 4/93 Reserve Major, Augusta K.C. 5/93 W.D., BOW, Best of Breed, Oak Ridge K.C. 5/93 W.D. BOW, Best of Breed, Greater Kingsport K.C. 7/93 Reserve Major, Tampa Bay K.C. 12/93 W.D. BOW, Best of Breed, Meri-Mis K. C.
5/94 Best of Breed, Oshkosh K.C. 5/94 Best of Breed , Fond du Lac K.C. 5/94 Best of Breed, Manitowoc County K.C.